As many as 20 children have died of diphtheria at the NDMC-run Maharishi Valmiki Infectious Diseases Hospital at Kingsway Camp and one at the Delhi government-run LNJP Hospital, taking the death toll due to diphtheria in Delhi to 21. “From September 6 onwards, there have been over 170 admissions out of which 128 were from UP. Rest of the cases are from Haryana and Delhi,” a senior North civic body official said. (HT, Sept. 27, 2018). Diphtheria is a serious bacterial infection usually affecting the mucous membranes of your nose and throat. It typically causes a sore throat, fever, swollen glands and weakness. Appearance of a sheet of thick, gray pseudo-membrane over the back of your throat and nose is its hallmark. This membrane can block your airway, causing you to struggle for breath. Diphtheria is a vaccine-preventable disease. It is extremely rare in the developed countries, thanks to the widespread vaccination coverage. In India it is included in the Universal Immunisation Programme (UIP) as DPT vaccine. In 2014, the Health Ministry launched Mission Indradhanush as a special drive to vaccinate all unvaccinated and partially vaccinated children under UIP. It aims to raise the immunization coverage in the country to at least 90% children by December 2018. The very fact that there has been an increase in the number of diphtheria cases in the capital, indicates the failure of the primary immunization program. Contaminated personal items – by handling an infected person’s used tissues, drinking from the person’s unwashed glass, or coming into close contact with other items on which bacteria-laden secretions may be deposited such as towels or toys. Airborne droplets – if you’re around an infected person when they sneeze, cough, or blow their nose, by inhaling the mist of contaminated droplets in the air. Infected wound – you can also come in contact with diphtheria-causing bacteria by touching an infected wound. People who’ve been infected by the diphtheria bacteria and haven’t been treated can infect others for up to six weeks after the initial infection — even if they don’t show any symptoms. Though children are routinely vaccinated against diphtheria in India, the disease is still fairly common among the poor strata where immunization rates are low. Children under the age of 5 and adults over 60 are particularly at a higher risk. A previous infection may not protect you against a future illness with diphtheria. death due to obstruction in the airway. People living in tropical areas or under poor hygienic conditions may also develop diphtheria of the skin. It usually causes ulcers and redness in the affected area. The worst possible complication of diphtheria is respiratory failure or death due to obstruction of the airway by the pseudomembrane. 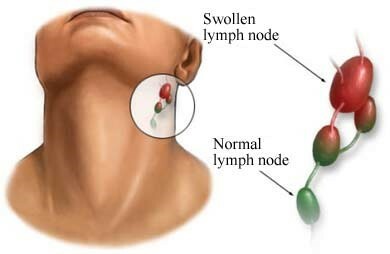 Your doctor would likely perform a physical exam to check for swollen lymph nodes after taking down your medical history and the symptom record. Though the thick gray coating on your throat or tonsils is diagnostic enough, they might take a sample of the affected tissue and send it to a laboratory for testing to confirm the diagnosis. A throat culture may also be taken if your doctor suspects diphtheria of the skin. Since diphtheria is a serious condition, the line of treatment is quick and aggressive. The first step of treatment is an antitoxin injection. This is used to counteract the toxin produced by the bacteria. Make sure to tell your doctor if you suspect you might be allergic to the antitoxin. They may be able to give you small doses of the antitoxin and gradually build up to higher amounts. Your doctor will also prescribe antibiotics, such as erythromycin or penicillin, to help clear up the infection. During treatment, you may stay in the hospital so you can avoid passing your infection on to others. A tracheotomy is sometimes needed to open the airway in severe cases. Antibiotics may also be given for prevention, in those who have been exposed to the infection. Diphtheria vaccine is effective for prevention and is available in a number of formulations (DTP, DT, Td). Three or four doses, given along with the tetanus and pertussis vaccine, via the intramuscular route, are recommended during childhood. Further doses of diphtheria-tetanus vaccine (DT) are recommended every ten years. Protection can be verified by measuring the antitoxin level in the blood. In rare cases, one might have an allergic reaction to the vaccine. This can result in seizures or hives, which will later go away. Many homoeopathic medicines are found effective in Diphtheria. Diphtherinum, a homoeopathic nosode (medicine prepared from a disease product/secretion – here diphtheria bacteria Corynebacterium or the diphtheritic membrane), when given in higher potencies is a sure shot preventive (three doses). If given in disease, its most effective in complications such as post diphtheritic paralysis. Also, when given at the start of the treatment, it helps to cut short the illness and prevents complications. Other important medications include Kali bichromicum, Lachesis, Lac Can, Lycopodium and Phytolacca. They are used effectively for the dissolution of the pseudomembrane. Apis mel, prepared from a bee sting, is most effective in severe edema of the throat with intense burning stinging pains. Bromium is given for membranous croup (cough) with much rattling of mucus and acute pain in chest, but the patient is unable to bring out the phlegm. Medicines like Merc cyan. are most effective in malignant diphtheria with pseudo membranous deposit extending all over the throat and fauces. If given before exudation these remedies check the disease by preventing the appearance of the membrane. Crotalus hor is indicated in diphtheria with hemorrhage from the nose and mouth, Pyrogenum in cases of septicemia due to the spread of toxins while Muriatic acid and Naja are indicated in conditions of impending paralysis as a complication of Diphtheria. Note :: If you happen to contract Diphtheria, please take medication only after consultation with your doctor. Next Next post: Hypothyroidism — Homoeopathy Can Treat It!